Backed by rich industry experience, we are manufacturing a vast variety of PET Bottle Air Compressor . The range made available by us is developed using right selection of accessories so that technically cooled and moisture free compressed air can be provided. Available in a variety of specifications, these reasonably priced products are demanded for various industrial applications. The NEC Range provides higher volumes of oil free air utilising energy efficient equipment and components. The double acting design of the NEC Range provides greater flexibility in capacity control combined with lower power consumption. The combined advantages of the NEC Range lead to an unrivalled range of features and benefits available to satisfy the increasing demands of today's PET Industry. The NEC range offers a neatly arranged compressor system that provides maximum oil free air capacity from the smallest available footprint. The NEC range is simply the lowest cost oil free solution for your PET compressor needs, exceptional performance combined with the following benefits, results in the most competitive compressor available on the market today. 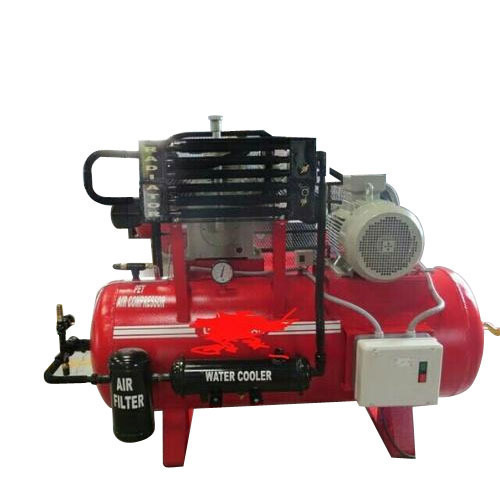 Established in the year 2011, we, “Shriram Engineering” are a renowned wholesaler, dealer, service provider and trader of an extensive range of all types of Air Compressors and Allied Industrial Equipment. Our range of products encompasses Pneumatic Products, Air Treatment Products, Air Compressor, Compressed Air Piping System, Industrial Lubricants. The range made available by us is manufactured using excellent quality material and components that are sourced from most trusted and reliable manufactures. All the offered products are widely acknowledged in market for their intrusive attributes such as longer service life, brilliant performance, high efficiency & reliability. Moreover, these products are offered in varied specifications at market-leading prices in order to cater to the diverse requirements of customers.